The Dawnwood Indrik is a mount datamined in Patch 4.0.2 that has yet to be available. 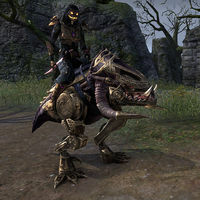 It was briefly seen being ridden by a player in the ESO Summerset Gameplay Trailer. Its default name is "Sparkle". The Great Dark Stag is one of the five Aspects of Hircine, invoked as Uricanbeg, "whose hooves drum the Blood Summons." Riding Skill does not affect this mount's appearance. 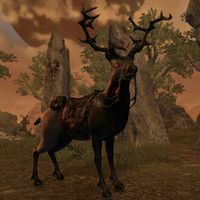 The Great Dark Stag is was available from the Crown Store for 040004,000 for one day, for fatal Fredas. Unlike other mounts, it has no visual upgrades for Riding Skill. Its default nickname is "Get of Uricanbeg"
Though the Reachmen of Markarth say they were the first to successfully domesticate the Great Elk of Skyrim and break them as mounts, the Nords of Haafingar say it was really all their idea. Riding Skill does not affect this mount's appearance. The Great Elk is is available from the Crown Store for 045004,500 . Unlike other mounts, it has no visual upgrades for Riding Skill. Its default nickname is "Chandelier"
The Nascent Indrik is is traditionally found roaming the isle of Summerset, Indriks are especially powerful magical creatures, and they can provide a challenge for even the most experienced adventurers. While it is possible to hunt them in the wild, it is possible to acquire one as a mount. In order to acquire the Nascent Indrik mount, players must take part in four in-game events and collect four magical feathers, with a different one available for each specific event in 2018. See the main page for full details. Its default nickname is "Quiescence"
The Onyx Indrik is a mount datamined in Patch 4.2.0 that has yet to be available. Its default name is "(?)". Dwarven Spiders' "wings" oscillate rapidly, followed by a red light appearing on their head. Rarest of all Dwarven Spider vamidiums are those powered by gems that emit a gold blue light, said to reflected the frigid stolen soul of the Dwemer engineer trapped within it. 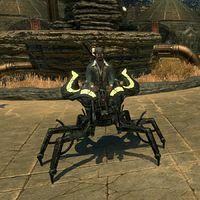 The Chroma-Blue Dwarven Spider Mount was available for a limited time in the Crown Store for 040004,000 . It can rise up on its hind legs and turn on a red light, releasing a large blast of (harmless) lightning on the ground. Its default name is "Blinkums". 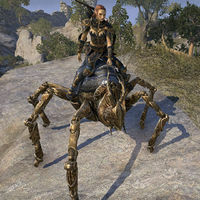 The Dwarven Spider Mount was available for a limited time in the Crown Store for 030003,000 . It can rise up on its hind legs and turn on a red light. Its default name is "Skitters". Infernium Dwarven Spider is an upcoming mount. Its default name is "Big Emberlegs". Kagouti can roar, similar to guar. The Hearthfire Kagouti appears to be a sort of magical hybrid, a wizard's experimental melding of a carnivorous reptile and a flame atronach. The fact that they were first sighted in the Telvanni Grazelands lends this theory some credence. The Hearthfire Kagouti is available from the Crown Store for 040004,000 for a limited time. Its default name is "Emberscale". Domesticating the savage Kagouti to serve as a mount is a recent endeavor, and to be frank, more than a little experimental. Do you have what it takes to stay in the saddle on one of these fierce, bipedal reptiles? 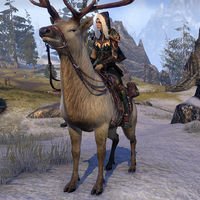 The Kagouti Mount was previously available from the Crown Store for 025002,500 . Its default name is "Touti Frouti". The Kagouti Fabricant is available from the Crown Store for 030003,000 . Its default name is "Robouti Kagouti". Nix-Oxen buck their hind legs. 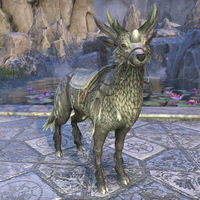 The Nix-Ox Fabricant is a mount available from the Crown Store between January 11 and 15th, 2018 for 3,500 crowns. Its default name is "Oily". The Novelty Stick Dragon is just a fake stuffed dragon head on a stick. It is available for 00350350 during the 2019 Jester's Festival. Its default name is "Mightyscales".